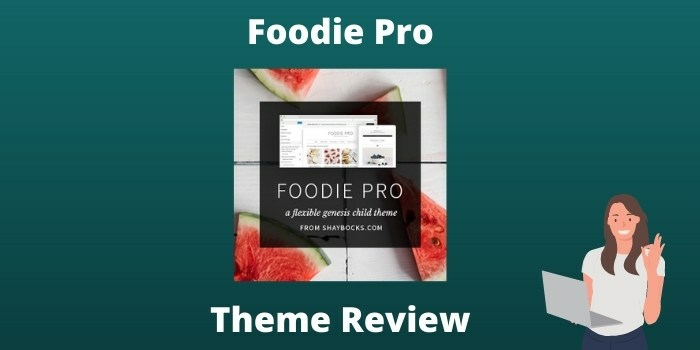 Foodie Pro Theme Review 2019: 8 Pros & 2 Cons To Check Out! If you're looking for one of the best food blog themes that is minimal yet feature-rich, fast loading, comes with the goodness of genesis framework then Foodie pro genesis child theme is what you should definitely check out. Saves you 1000s of bucks on hiring designers. Check out the theme now. A luxury your blog deserves! Are you looking for a brandable, feature-rich yet clean food blog theme? If that’s an yes, you have a thing to rejoice. In our Foodie pro theme review, we’ll see how Foodie pro theme can give you the freedom to redesign your blog (may it be a food blog or a blog in other niche) the way you want it without having to mess with codes or hire a costly designer. Foodie pro is a clean, light-weight, highly minimalist (yet feature-rich) genesis theme for food blogs, fashion bloggers and even blogs of other niches. Click here to see the live demo of Foodie pro usage (opens in new tab). It is the most selling feminine genesis child theme by StudioPress themes and is one of the top 10 in our ever updated list of best WordPress blog themes. With the huge success of Foodie pro, the maker Shay Bocks has become a star for every food blogger out there. Her other notable and best food blog themes are cook’d pro (check cook’d pro theme review here) and brunch pro. Nearly 100s of blogs use this theme yet no two blogs look similar (I told you you could mold it the way you want it). 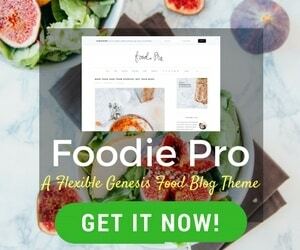 In this review of Foodie pro genesis theme for 2019, we will see how you can use it to give your food blog a visual uplift without compromising on the content or monetization. Let’s See What Makes It The Best Food Blog Theme! Foodie pro theme comes with the goodness of StudioPress themes (the largest seller of WordPress themes & StudioPress sites) which makes it reliable and secure to the core. Let’s head on to the features overview of Foodie Pro theme. When it comes to the security of our online businesses, themes play a very important role there. You could buy a food blog theme for $50 or less but eventually you’re risking your blog’s security and branding with it. Foodie pro comes with the genesis framework which is the most trusted theme framework amongst WordPress users. Most popular blogs (be it food blogs like PinchOfYum.com and MinimalistBaker.com or any other niche blogs like QuickSprout.com or Problogger.com) trust their sites with genesis. And it isn’t the security only, genesis child themes have been clean-coded so they are lightweight and lightning fast to load. In case you don’t know, Google favors sites that load faster. According to a research, 47% of the site visitors expect your sight to load within 2 seconds and 40% of them abandon your site forever (Hey! There are tons of food blogs waiting for them) if it takes more than 3 seconds to load. The other benefit of genesis framework is when you update your theme you’ll update only the framework and not your customized version of the child theme. Hence, you never lose your customization. Foodie pro revolutionized the food blog theme world by bringing in unlimited layout options (remember I told you no two blogs look alike?) and widget areas that help you place your ads, recipes and images (even for Instagram follow or Pinterest boards widgets) along with your content. It is a very minimal elegant theme with clean looking interface so that all the focus goes to the content section of your blog. Ultimately, this is what most blogs should aim for. You can import all the default widgets that you see on the demo theme with just one click. After that, it just needs filling the input areas with your custom information (like social channels, popular posts or newsletter widget). Mobile Responsive: Foodie pro is highly mobile-responsive theme that makes your mobile readers drool over your site design and easiness in reading. If you do not know, mobile responsiveness is also a key ranking factor. Unlimited Color Pallete: Foodie Pro doesn’t come with a preset color-scheme option because they believe why have a preset number of color schemes when you can give users the freedom to choose from unlimited color options to match your branding and styles. Visual Typography Selection: With regards to typography also, you got plenty of options to select the font styling that defines your food blog’s branding.Foodie pro includes visual editor to easily change fonts color and typography without having to touch a single line of code. Soon to receive Gutenberg compatibility: Unlike many theme shops, StudioPress is committed to give you a pure Gutenberg experience and Foodie Pro will be soon compatible with Gutenberg. It doesn’t mean it is not compatible, the update will bring more features to the theme. One of the key components you should check out when you are buying a food blog theme is the recipe page options. This is a very crucial part and so I have included it in my review of Foodie pro theme. With Foodie pro, you get a custom designed recipe archive page where you can store all your recipes for easy access by readers. You have the option to set up display based on dates of posts, categories of recipes (like appetizers, dinners etc) and a search form to search any recipe based on a keyword. All recipes are auto-indexed and you don’t need to update the archives every time you publish a post. Foodie pro supports easy recipe pro which helps you create well documented and well formatted recipes with custom print styles, reading styles and easy import and export facility for recipes. Foodie pro theme allows you to set up a separate shop section on your blog (using this plugin) to sell your own products or affiliate products. This is the best way to sell on your blog and monetize your food blog with your own products, premium recipes, or even affiliate products. Foodie pro is one of the best AdSense friendly WordPress themes out there. Foodie pro comes with brilliant, high converting strategic ad placement options to help you make a decent income. There is this custom header ads, and ad widget above everything else, sidebar ads, ads after the blog posts and even a responsive ad unit after the entire footer to help you get noticed without damaging the reading experience. You can of course use these strategic (optimized to convert) ad placements to place your own affiliate programs (check here for a list of high paying affiliate programs) and earn better than traditional ads. If there is one thing I can ever suggest to anyone blogging, that would be build your own email list. Email list building is the first mistake everyone makes (I did this too) and now that I know how important it is to grow your own email list, I look for this feature in every theme I use. Foodie pro theme has a sticky floating email subscription bar in the header (optional) that you can use to grow your email subscribers. You also get genesis eNews widget to have a stylized inbuilt subscription widget on your sidebar. Whether you have a social following or not, getting your site ranked on Google is what can give you meaningful readers. Organic traffic comes with a buyer intent and is the key for any blog’s success. Now, if you have a well-optimized theme, follow the basic SEO techniques it becomes easier to rank on Google. Schema markup enabled: Ever saw those star ratings & recipe info when you search for something on Google? That appears when your theme is fully schema markup enabled. Now that we have a clear, in-depth Foodie pro theme review, let’s see the use cases of Foodie pro theme. Here are some magnificent food and lifestyle blogs that use foodie pro to give their content the exposure it deserves. NOTE: There are 100s of blogs that use Foodie Pro genesis theme. But, listing them all is beyond the scope of this review article. Hence, we list the top Foodie pro theme examples (Feel free to send us any beautiful site we missed to list in the comments section below). Let’s see what are the main demerits of Foodie pro genesis child theme. As I told you this is going to be an unbiased review, here are the cons. The theme is a bit costly (as compared to other cheap themes): But then, you won’t expect a brandable, feature-rich, fast loading and SEO optimized theme to be free. Again, hiring a designer will cost at least $1000-$1500 for basic customization. Buy it if you want to take your blog to the next level only. The initial setup can take a bit time: Every theme you buy would require time to set it up, place the correct menu in appropriate places and so on. So this again is understandable. As per the pricing Foodie pro is a bit more than other food blog themes. But, with less than $130 you get a beautiful stunning theme that can be used over and over again by changing the layout and unlimited color palette options. You can use it on unlimited sites with lifetime updates. The pricing is nothing if you compare it to 1000s of bucks you have to pay your designer to get simple customizations done. With Foodie pro you become your own blog designer and design it as per your taste and when you want. Editor’s Opinion: Don’t buy it if you’re just starting out or are not serious about the potential of turning your food blog into a successful business. But, if you are serious and know that you can turn your passion of cooking or lifestyle expertise into a profitable online business, you should definitely buy it. The email capture forms in the theme will help you build your own food blog tribe and strategic ad placements can help you monetize your blog to recover the theme investments in maybe a month or half. Apart from 100s of free genesis theme customization tutorials online, you get hands-down the best support for themes. Foodie pro theme is the product of world leading StudioPress themes. They are professionals and highly reputable in the field of WordPress blogging. Service from StudioPress is top notch! They have a good customer service, and since they’re the largest theme seller for WordPress there are tons of expert tutorials and a huge community to help you out with anything you need. Most of time, I don’t even reach out the customer service, just a single Google search pulls out tons of genesis tutorial sites that have the snippet or tutorial I need. As we see, foodie pro is hands down the best food blog theme for WordPress bloggers. It has many advantages that saves your money and gives you the freedom to customize your own blog without touching a line of code. $129 is a great investment deal if you’re serious about your blog. Take a free demo tour here or get your copy of foodie pro here. If you're looking for one of the best food blog themes that is minimal yet feature-rich, fast loading, comes with the goodness of genesis framework then Foodie pro genesis child theme is what you should definitely check out. Saves you 1000s of bucks on hiring designers. Check out the theme now. WPForms Review 2019: Best Contact Form Plugin For Now? I love how clean and simple the theme looks. Very attractive for a food theme no doubt. I love how simple and clean this layout is! This is one of my favorite themes, and while I haven’t invested in it yet, it’s at the top of my wish list. Thanks for breaking down the features so much for me! Sounds perfect! It looks beautiful too. Very clean, elegant and user friendly. I am so glad to find this since I’m thinking about switching to it this summer.